When Will the Senate Budget Committee Majority Ever Learn About Sector Financial Balances? Posted on April 8, 2015 by Joe Firestone | Comments Off on When Will the Senate Budget Committee Majority Ever Learn About Sector Financial Balances? There are two words that describe the Republicans’ Senate Budget Committee’s proposed budget: “dishonesty” and “austerity” for most Americans. Let’s deal with the dishonesty part first. In due course, the austerity will be apparent. – continuously slower growth in mandatory spending (Social Security, Medicare and other health programs, food assistance, unemployment support, other entitlement spending) (33.9% vs. 56.3% for the baseline). Meanwhile, the Senate plan calls for slightly increased defense spending over the period compared to the baseline (24.4% vs. 23.9% increase). That’s right with these levels of projected spending we’re looking at austerity for the poor, the young, the aged, and the middle class, since all the programs they benefit from will undergo a continuing squeeze for the Senate’s budget plan. On the revenue side, the Senate plan, along with the House Budget, projects a 45.3% increase in revenues over the decade, while the CBO baseline projects a 44.5% increase. The difference among these is probably due to rounding and different estimates of how fiscal 2015 comes out before the 2016 – 2025 projection period. Where does the Senate estimate of tax revenue come from? CBO is the obvious source, and its estimates in turn come from its projections of the recent past and expectations about the impact of scheduled tax increases, which the Republicans in the Senate plan to repeal. The projections of past revenues, along with the impact of scheduled changes in the law, then get applied in the context of CBO’s GDP projections to get to projected revenue. Of course, these can be easily thrown off track if an unexpected recession occurs. So, projected tax revenues are dependent on and sensitive to CBO projections of GDP. But, future values of GDP, in turn, are greatly influenced by government spending and even more by deficit spending. So, do budgets like the Senate GOP’s that reduce government outlays considerably from the present levels, offer anything else that might grow the economy, and jobs, and increase revenues to the levels claimed in the Senate budget? Well, the Senate Budget Committee’s majority says that the lower government spending and lighter regulation provided for in their budget will, in addition to the CBO estimate that the baseline budget would add 1 million jobs to the economy, add perhaps as much 1.5 million additional jobs over the 10 year period. Why? Because reduced regulation and lower government spending creates private sector jobs, of course. Is this a serious claim? Has it ever worked in the US in recent memory? If so what is the causal chain running from these two things to more jobs that has worked and can be counted on? The Republicans think that the causal chain works this way. According to “crowding out” theory, an inviolate assumption of CBO ideology, the government borrowing needed for deficit spending dries up limited available funds in “the loanable funds” market. In this way, government borrowing drains off funds that, in its absence, might or would be used for private investment to grow the economy. This “crowding out” effect isn’t as important in the short run as the effect of government spending in raising aggregate demand. So, in the short run, perhaps the first three years of a decade, larger deficits grow the economy faster than increasingly smaller deficits or balanced budgets would. But in the longer run, the stimulative effects of government deficit spending fade away, and then the “crowding out” effect reduces aggregate demand and slows the economy more than would be the case if there had been no deficit spending in the first place. The way CBO applied this to the Senate Budget Committee’s plan to reduce deficit spending is that it projects lower levels of economic growth in 2016 – 2018, but then beginning in 2019 it projects increased growth in each year until 2025, with 2025 GDP being 1.5% greater than it would have been under the CBO baseline. There’s a lot that’s wrong with this fairy tale, CBO or no CBO. First, there’s no loanable funds market. When banks make loans to credit worthy customers, they conclude their loans and create deposits in the accounts of their depositors before they acquire the reserves they need to have according to Federal regulations. If they find that they are short of the required reserves, then they borrow from other banks in the repo market, or they go to the Federal Reserve discount window to acquire the reserves they need. What they don’t do is to turn down a credit worthy customer because their computer screen tells them that their banks don’t have deposits from private individuals or institutions to underwrite the loan. Again, they make the loan without any reference to any loanable funds market and get the reserves later, if necessary, from the Federal Reserve which creates the needed reserves “out of thin air.” So, there’s never any shortage of loan funds available because those funds were soaked up previously and made scarce in the private sector by government borrowing from private investors. Second, even if it were the case that people who wanted to invest in private businesses were holding government bonds, rather than reserves, that would not stop them from making investments if they found a venture that was likely to add to their wealth. This is true because government bonds make excellent collateral for loans from banks creating new deposits which can then be used for investment. In addition, if the investor doesn’t want to use bonds as collateral, even though they are leverageable multiple times, government bonds are also very liquid. So holders of government bonds can easily sell them to gain liquidity at any time. Third, CBO and the Senate Budget Committee assume that to run deficits, the government would have to increase its debt subject to the limit. But, under current law this is a matter of choice, since the Treasury is free to fund its deficits using platinum coin seigniorage, a method that would add to the money supply in the amount of the deficit spending involved, and in no way soak up “loanable funds” already out there. And fourth, even assuming, for the sake of argument, that “crowding out” was true, it still would not follow that lower deficits would add to GDP in the out years more than other budget scenarios that depart from the baseline. For example, what about budgets that compensate for any long-tern effects of “crowding out” by using additional deficit spending to stimulate the economy? If such deficit spending were great enough, then its effect might well be far greater in increasing economic growth than the Senate Budget Committee’s path of decreasing deficits, until in 2025 there is a small surplus of $3 Billion out of a projected GDP of 27.5 Trillion. “Well that’s not relevant because CBO only said that the Senate’s budget would increase GDP by roughly $500 Billion over the CBO baseline over the decade of projection.” Well, sure, that’s what CBO always says. But look, CBO’s baseline is a projection based on current law. The Senate Budget Committee’s assumes changes to current law. So which is more relevant, the comparison of the Senate’s plan to the baseline, or the comparison of other, competing scenarios incorporating policy changes both to the baseline and to the Senate’s plan? Why isn’t CBO required by law to take an objective stance and evaluate competing budgets prominent in the public domain against one another, rather than only evaluating budgets of the majority party against its current law baseline? Not to put too fine a point on this, a budget plan involving policy changes that only grows the economy by less than 2% of one year’s GDP over a decade, or an average of 0.2% per year is certainly not much of an improvement over current law, and it indicates that the Senate Budget Committee knows very well that there’s not much in their plan that will support growth. So, why would anyone trumpet that as a promising aspect of one’s scenario? How low must one’s standards be, and how little must one care about economic growth to implicitly ask for political credit for such an unvisionary and unpromising budget plan? And finally, how dishonest must one be to suggest that this kind of growth performance indicates that one’s plan supports economic growth? Further, if the Senate’s budget were to create the 2.5 million jobs from 2016 – 2025 it claims, then what would be so great about that? That’s about 250,000 jobs per year or about 21,000 per month. The Senate Budget Committee’s report on ts budget also claims that the above job creation performance would nearly double the current job creation rate. So, they want us to believe that 21,000 jobs per month is nearly double the current job creation rate. Where do they live, on Pluto? Last time I looked, it took 90,000 new jobs per month just to make up for new additions to the labor force, so 2.5 million new jobs in 10 years is pitiful job creation performance. Over the past year our current economy, far from one experiencing full recovery, has still created 2 million new jobs. The Senate Republicans know this as well as anybody. So, what misbegotten marketing guru advised them to trumpet this projection, and how dishonest is it to claim that 2.5 million new jobs in 10 years is job creation performance worth boasting about as the Senate Budget Committee does? Anyone for 25 million jobs over a decade? How about 35 million jobs? Now that’s something that can be marketed. 35 million new jobs might just create full employment for the 20 million or so who now want full time jobs but can’t find them, and the additional 15 million or so who may be entering the labor force over the decade of projection. But 2.5 million new jobs will fall far short of fulfilling these needs, and representing that low level of job creation as worthy budget job creating performance is just another mark of pure and cynical dishonesty, and contempt for the American people. With the above as an introduction to my claims that the Senate Budget plan is both one that would produce increasing austerity, and that is also presented in a highly dishonest manner, I’ll now turn to the question of whether their budget plan is in any way consistent with what is possible under the constraints imposed by the sector financial balances. Once again, I’ve provided a brief introduction to the sector financial balances in an appendix at the end of this post, for the convenience of readers who haven’t used them before. 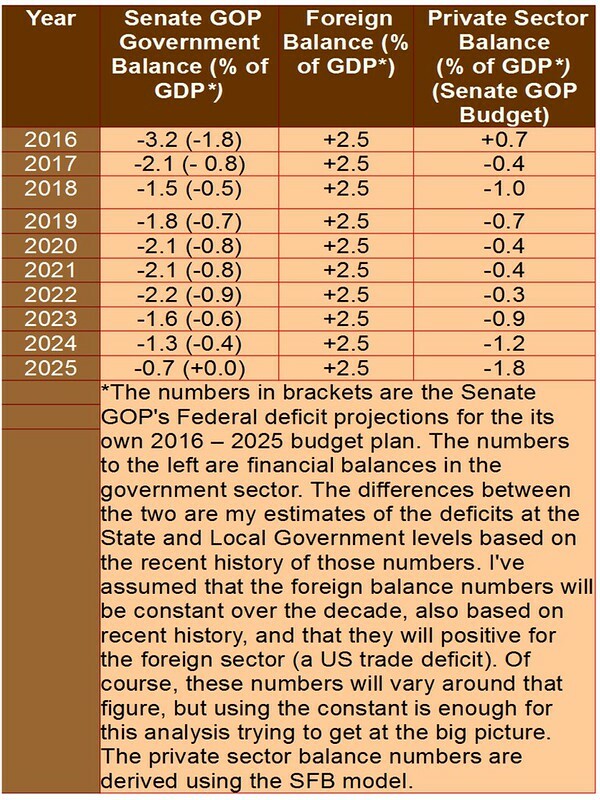 So, now let’s apply the sector financial balances framework to the Senate Republicans’ Federal budget projections from 2016 – 2025, as in Table One, just below. The table shows the by now familiar macro pattern of private sector losses found in all the deficit reduction budgets I’ve been reviewing. This one is closest to the pattern found in the Republican House budget. Assuming a 2.5% current account deficit, and a foreign balance of +2.5%, that leaves a private sector surplus of 0.7% if we apply the SFB model to 2016. That surplus becomes negative in 2017, and after 2017 there are aggregate private sector deficits in every succeeding year through 2025 when there is a private sector deficit of -1.8% of GDP. The significance of years of these private sector deficits, is that they are likely to hurt private sector balance sheets badly, continuously, and cumulatively, especially those of middle class and poor people, cutting into aggregate demand and the credit worthiness of large swathes of the population. Eventually that will lead to a pull back of credit in the private sector, followed by collapsing demand, declining sales, increased unemployment, recession, and, in the end, expansion of safety net outlays beyond those projected in the Senate budget. The Senate budget suggests there will be a private sector consistently losing net financial assets, whose expansion is unsustainable. Such losses, due to structural factors of economic influence and power, will be unequally distributed and be borne more by the middle class and the poor, rather than the 1%. This means a consumption downturn and a spiraling of the economy downward. When that recession happens, the Senate budget will have caused a weaker safety net, and no jobs programs in place to handle the downturn. That also means that even if the Senate budget were passed and was successful in reducing deficits, its drive toward small deficits will cause a pullback in the economy, probably sooner rather than later, and then the remaining government spending automatic stabilizers, though weakened, will still drive up government deficits invalidating its deficit and growth projections, which are, frankly, unbelievable in the absence of a credit bubble to sustain demand. These deficits will accompany an economic pullback causing widespread and growing unemployment once again, and a further need to “fix” the economy. To conclude, I’ll repeat what I said in my post on the CPC budget. Macroeconomic constraints on budget planning implied by the sectoral balances suggest that if we want to stabilize our economy in a sustainable way, we have to create budget plans that will accommodate private sector desires to both run trade deficits and have a reasonably sized private sector surplus every year. Assuming that 6% of GDP is reasonable for that surplus, and that the private sector would like to import 2.5 – 3.0% of GDP more than it exports, that means that a fiscally responsible budget for the United States, with the right fiscal multipliers, should approximate an annual government deficit of 8.5 – 9.0% in the US’s present situation. That’s not something we ought to force with fiscal targets, because the best policy is to let the government deficit float and spend on the right programs to produce full employment at a living wage as well as to implement various programs that will solve our many other problems. However, a level of 8.5 – 9.0 percent of GDP is still a rough measure of how far short of what’s needed all the budgets we’ve been examining are. All of them claim that are fiscally responsible budgets, but judged against what’s needed to solve our various problems, all of them are profoundly fiscally irresponsible. Nor is the level of 8.5 – 9.0 percent I’ve given above necessarily the deficit level that would be produced by a fiscally responsible budget. Instead the level of the deficit may be greater than this figure if the economy absorbs more deficit spending before it reaches full employment with price stability, as well as other goals. The figure I’ve given above is just a starting place. The deficit should be allowed to float until the real outcomes of fiscal policy we seek are achieved. The measuring stick has to be closeness of approach to these goals, among them full employment and price stability, and not the deficit level per se. The message is stop targeting deficits! Start targeting real outcomes in the real economy! Start doing budgets that project these real outcomes and don’t focus on the deficit at all, except as a post hoc accounting artifact of the effort to continuously achieve public purpose. That’s what we should be about, not hitting some predetermined balanced budget goal inherited from our long gone gold standard days. The terms refer to balances of flows of financial assets among the three sectors of the economy in any specified period of time. Why must there be flows? Because the three sectors trade financial assets with one another. So, the equation says that the sum of all the balances of flows for the three sectors of the economy is zero, because, since there’s only so much in assets traded in any time period, the positive balance(s) of one or more sectors relative to the others must be matched by the negative balance(s) of the other two sectors. So, for example, when the annual domestic private sector balance is positive, more financial assets are flowing to that sector, taken as a whole, than it is sending to the other two sectors. Similarly, when the annual foreign sector balance is positive, more financial assets are being sent to that sector than it is sending to the other two sectors. And when the annual government sector balance is positive, then it is getting more in financial assets from the other two sectors combined than it is sending to them. Conversely, when the private sector balance is negative, the private sector is sending more to the other two sectors than it is getting from them, and so on for each of the other two sectors. This entry was posted in Joe Firestone and tagged budget plans, budget projections, CBO baseline, Congressional Progressive Caucus, debt and deficits, MMT, Modern Monetary Theory, OMB budget projections, Republican House budget. House Budget Committee, Sector Financial Balances, Senate Budget Committee. Bookmark the permalink.